The smell of hot vintage engine oil hit about half a mile out. 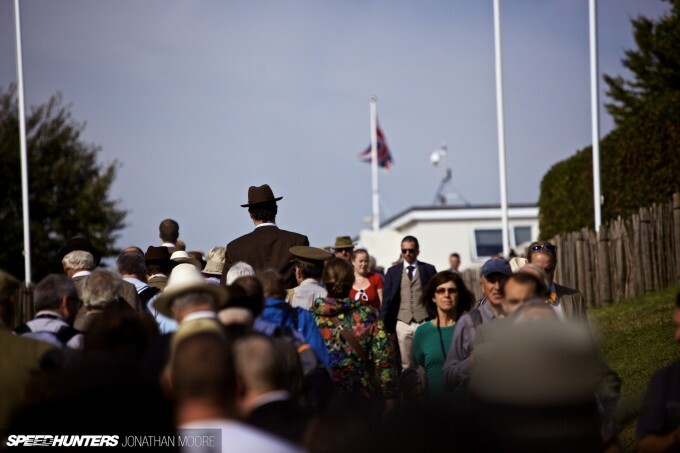 It was just as a small queue began to form at the Forward Parking area, in the early morning of the first day of the Goodwood Revival. Its acrid tang was instantly recognisable, evoking the raw mechanicals of decades past in general – but also specifically the rug of Castrol GTX that hung over the Brands Hatch paddock I roamed as a child. It was a welcoming smell. It promised that technology would be stripped away with every advancing yard, that the years would roll back as I got closer to the entrance. The cut-off point of 1966 beckoned. 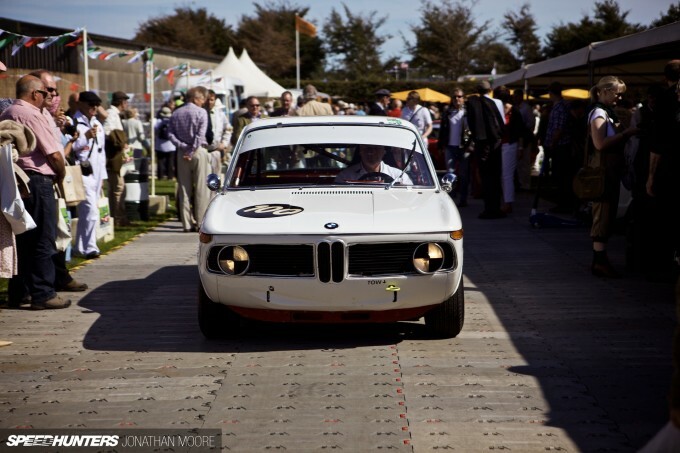 It reassured me that, as usual down at Goodwood, everything would be just perfect. This could have been an article where it could be perfectly possible not to feature a single car centre frame: a pure reflection on culture. 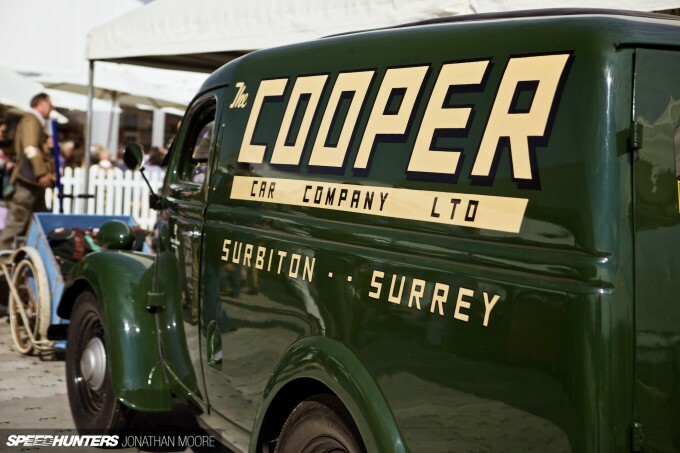 Goodwood is fundamentally about cars, make no mistake, but at the Revival they’re a comforting backdrop, the excuse that brings hundreds of thousands of like-minded people together to celebrate a glorious past in a revelling present. 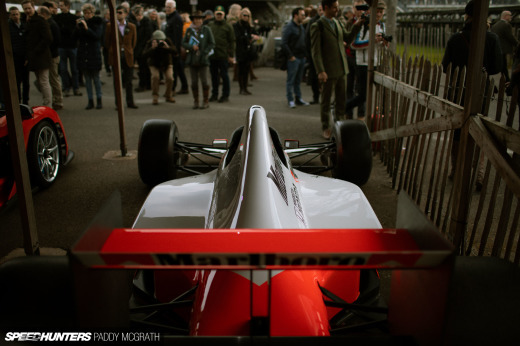 However, much as it would be easy to fill an entire story with background and atmosphere, the quantity of cars at Goodwood is matched by their quality. Here there’s no discussion over authenticity. 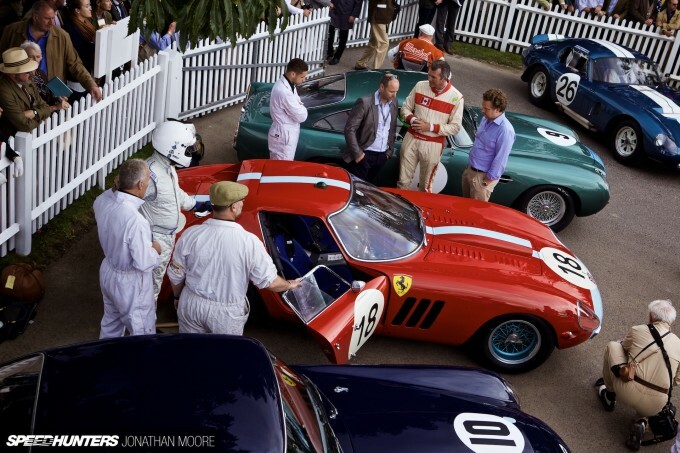 The massive crowds ebb and flow around the sprawl of the Goodwood Motor Racing Circuit, soaking up the almost total access that’s available. They part like the sea on the blasts of marshal’s whistles, as the next set of racers slowly make their way to the formation area prior to taking to the track. One minute you’re sauntering through the paddock, the next you nonchalantly step back to let a snarling Ferrari or massive Bentley pass. If I’m honest, the Revival is an event where I’d much rather not have modern cameras slung over each shoulder. In fact, I’d rather not have any camera at all. You can end up looking through the tunnel of the lens, spying individual moments rather than immersing yourself in the intoxicating atmosphere. It’s a place to go with friends. 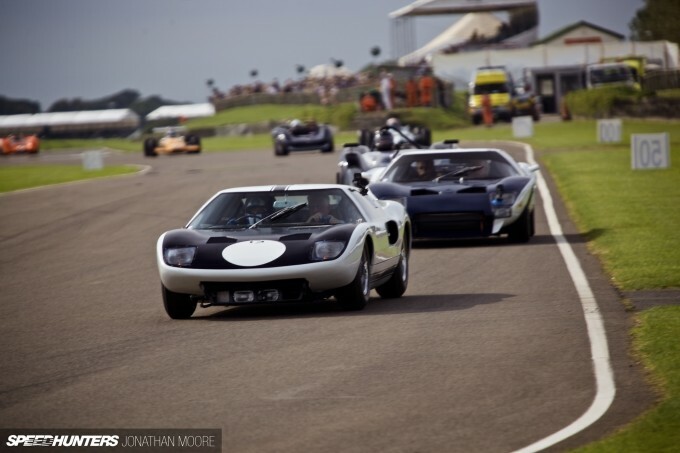 The Revival thrives on its social aspect: the shared joy when you stumble across another massive paddock of cars you didn’t even realise was there, half of which you might not even recognise at first. 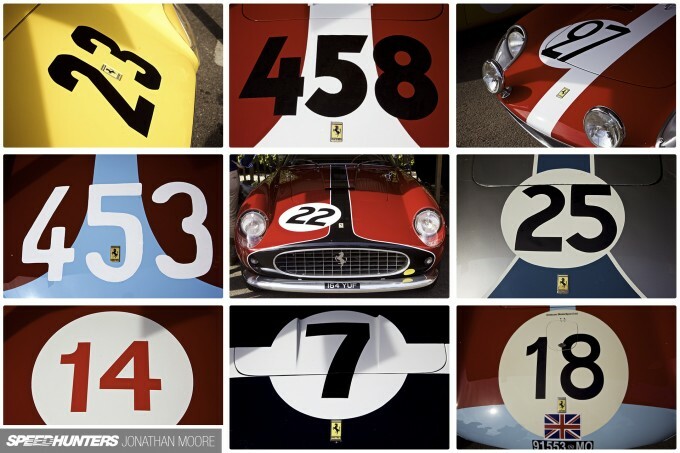 Then there’s the kudos of who spots the next racing celeb first: it’s almost like a bingo card of racing icons past and present. 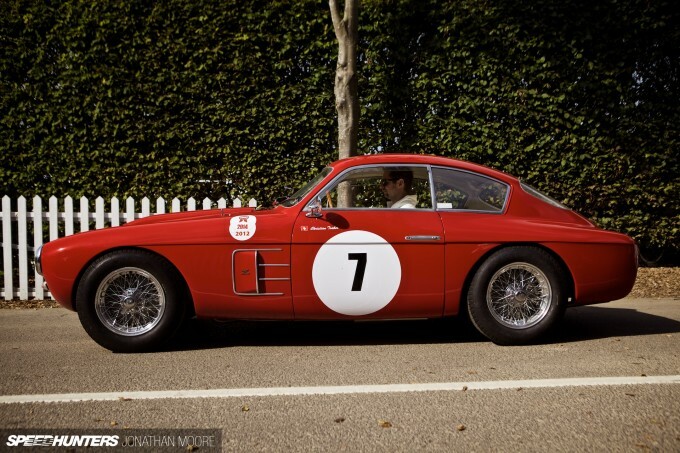 Even better if the driver matches the car – which is not unusual. 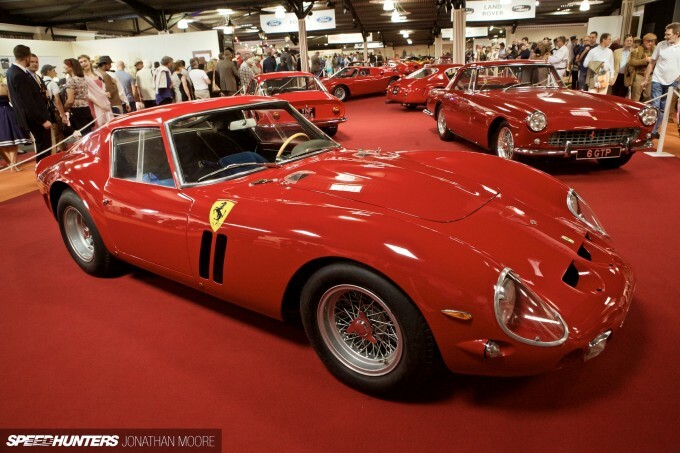 Owners use the Revival as their reason to restore specific cars or bring them back into the public eye, quite often for the first time in decades. The invite-only race card is so valued, but it also creates a virtuous circle. 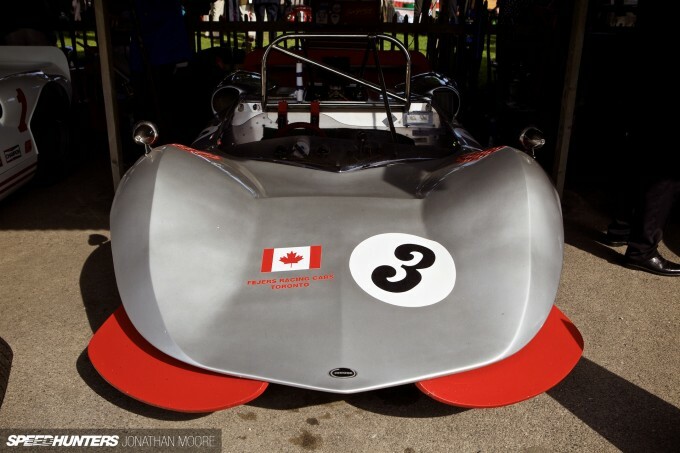 The organisers deliberately attract the rare and the wonderful, like this Chinook Mk2, a Canadian entrant into the legendary Can-Am series of the ‘60s. Based on a McLaren M1A, the big-banger Chinook evolved to Mk2 customer spec – this Chinook was part of a three car batch purchased and restored in the UK, making its return to the track after a break of 43 years. It’s not at all unusual to come across a machine that stops you dead in your tracks and has you reaching for the programme after another game of guess-the-car. 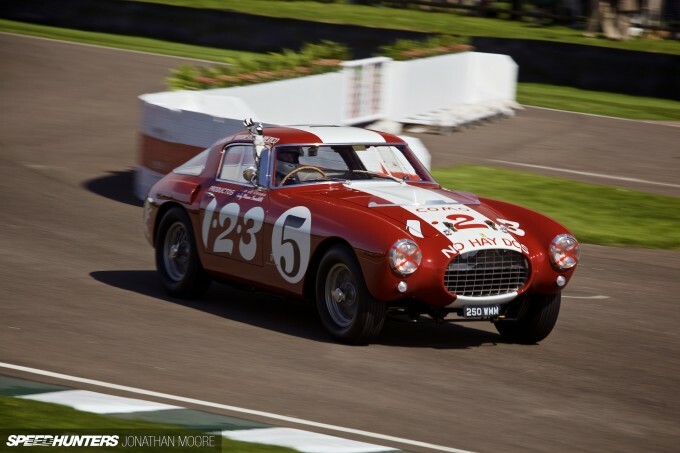 This was a beautiful Fiat 8V Zagato running in the Fordwater Trophy for GT cars made between ’48 and ’54. 8V? 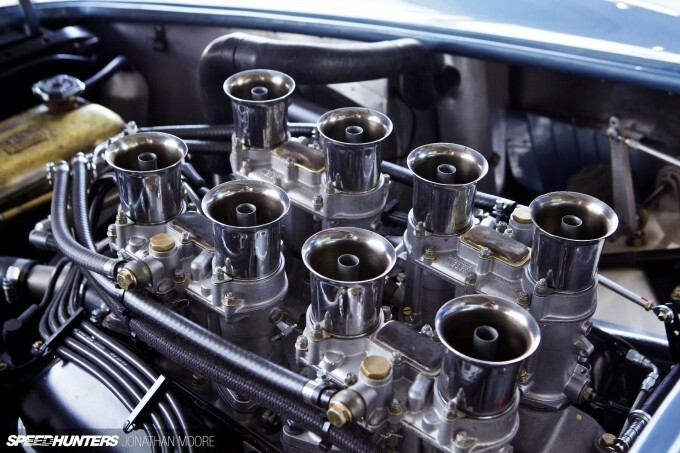 Apparently Ford had copyright of the term ‘V8’ at the time! Then there was this, well, what can only be described as a tractor. There is a reason for the less-than-attractive bodywork though on this, one of only two surviving Healey Duncan Drones form 1947 – and it’s what lay underneath. The chassis was a Healey Silverstone, one of the fastest sportscars of the time, but 66 per cent purchase tax made them phenomenally expensive. 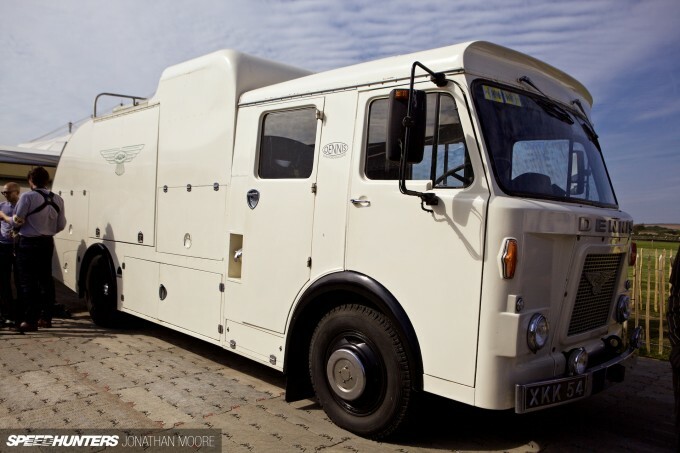 So, Duncan Industries took the chassis, applied this rudimentary bodywork and made things like passenger seats, spare wheels and windscreens ‘optional extras’, putting the car below the tax threshold. 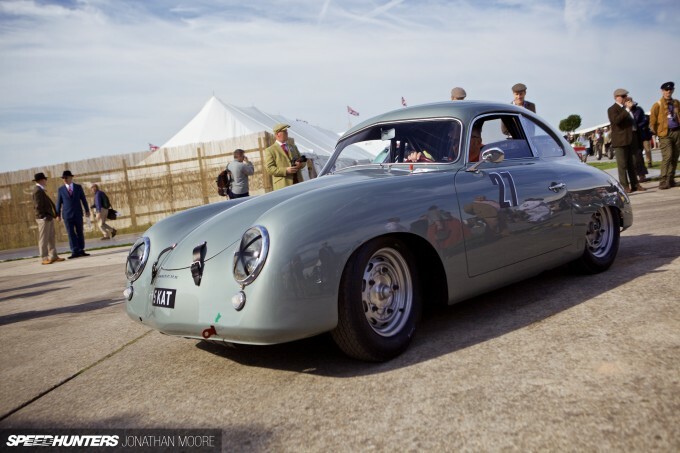 Most Drones were then – sensibly – rebodied, but this brute survives as was – and was even entered in the 1949 Mille Miglia. 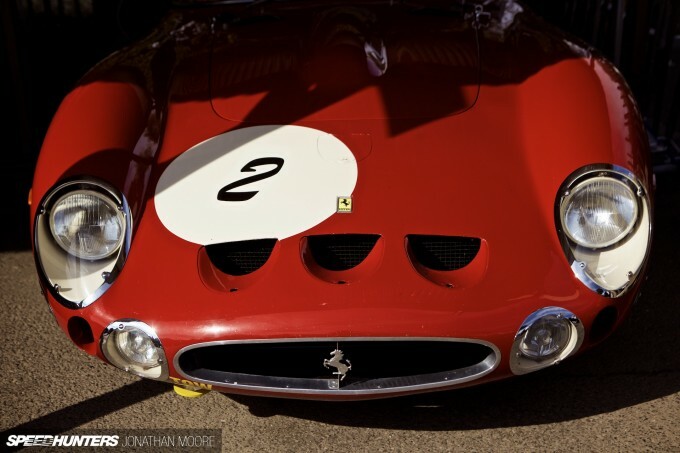 It’s a great story: no beauty, just a beast! 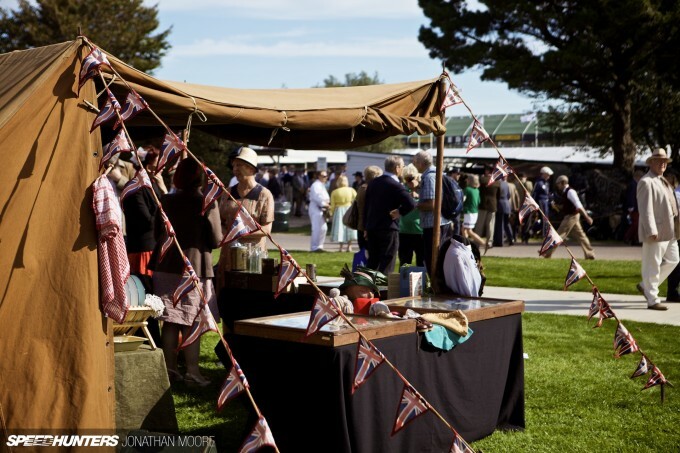 Despite its overtly British-to-the-core presentation, the Revival is a truly international event. 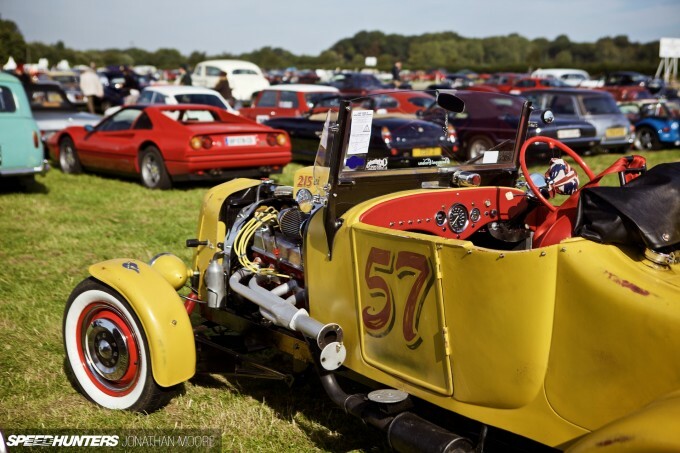 Every year that I attend I hear an increasing number of foreign accents and languages – French in particular, who in turn export the Revival’s vintage chic back to domestic events like the Autodrome Héritage Festival at Montlhéry. It could be kitsch and quaint, with its adherence to period dress and etiquette, but the important thing to remember is that the comfort blanket of vintage that is draped over the Revival is very lighthearted. It’s done more to break down barriers than reinforce them, and really is just a bit of fun. That said, there’s also a massive poignancy. The era that the Revival celebrates isn’t blindly revered. Drivers were killed with frightening regularity; the vintage tracks I so often eulogise about were typically lethal if the drivers made errors; the cars were dangerous, wild and unpredictable. 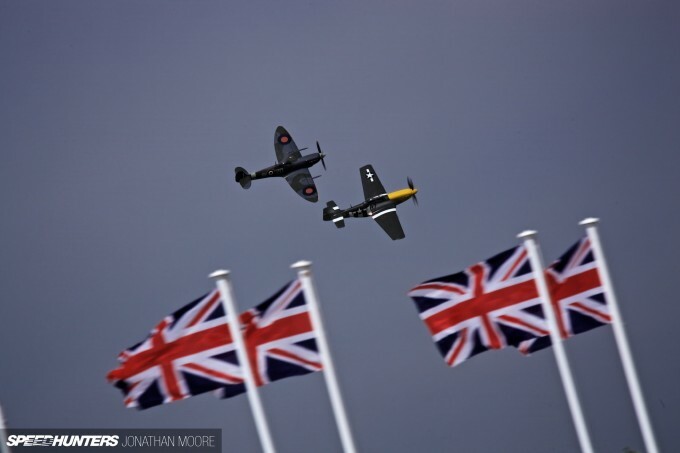 Goodwood is the best possible way to remember the icons that have been lost, both in period and since, a reminder that motor racing was and always will be a dangerous business. 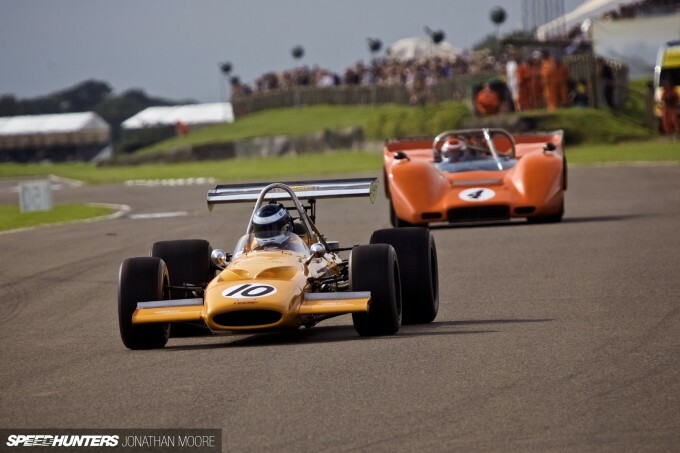 This year’s parade paid tribute to a legend fundamentally associated with Goodwood, Bruce McLaren. The gentle Kiwi was both ace driver and talented engineer, his life cut short at Goodwood in 1970 after a testing accident. 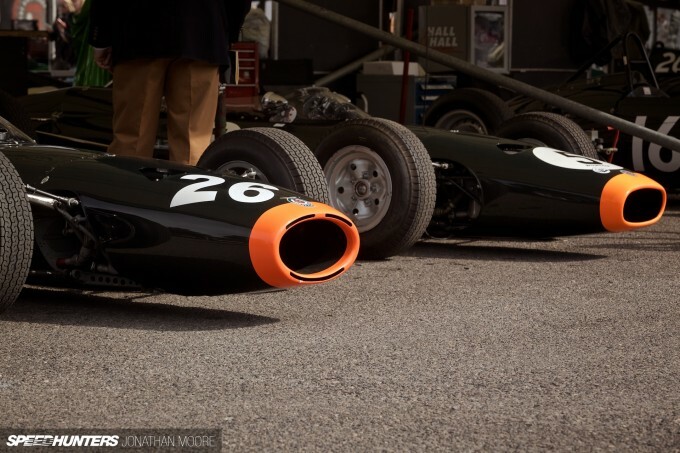 The parade of cars he both drove and developed was all-encompassing, from Cooper and Lotus single-seaters he raced when he first arrived in Europe, through Jaguar and Aston Martin sportscars to his own F1 and Can-Am machines. 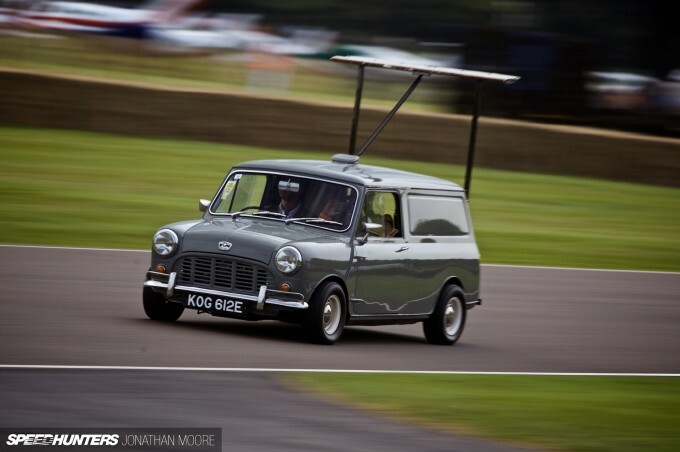 But amongst the more familiar was this crazy thing: the team’s Mini Van, which was re-purposed in spectacular style to test out wings for the McLaren Can-Am programme. 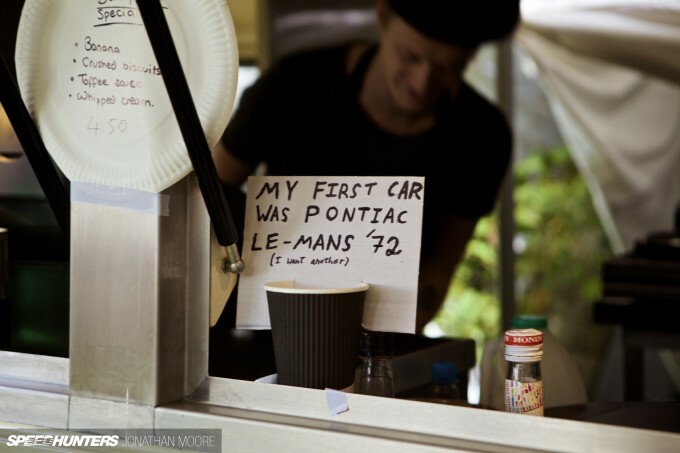 Bruce McLaren’s name is also entwined with the story of the GT40. 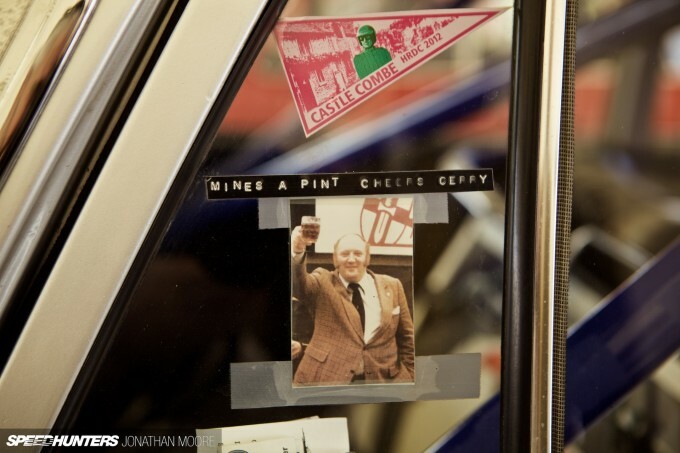 He helped develop the original car, racing a prototype at the Nürburgring in ’64 before famously going on to win at the 1966 Le Mans 24 Hours in MkII. 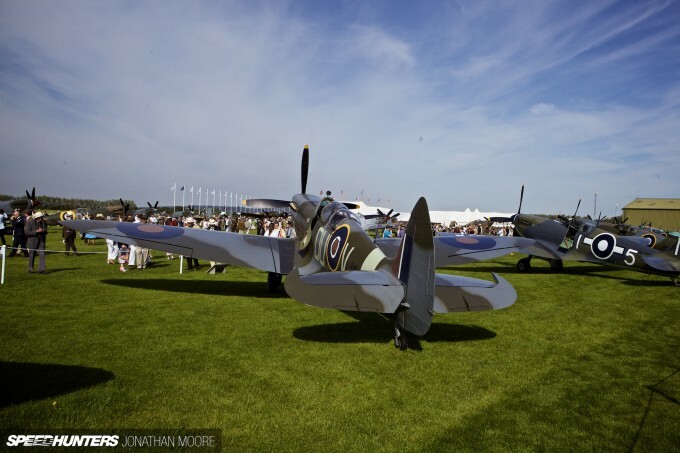 That smell of oil on the approach to Goodwood wasn’t just emanating from the track. A Series 1 Land Rover stuttered to a halt just in front of me, just a hundred yards short of entrance. 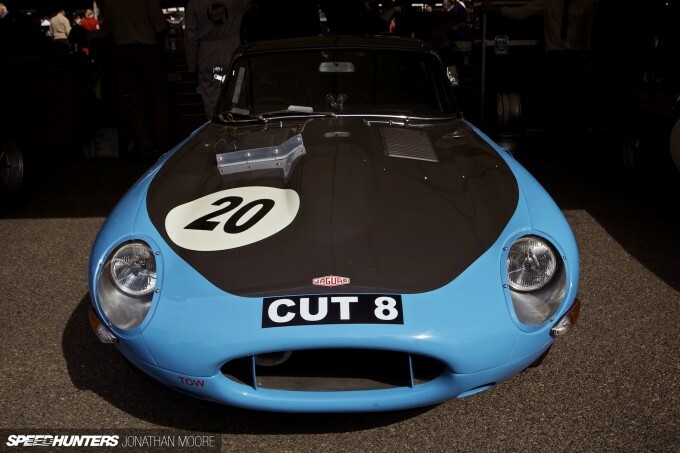 An E-Type sat with its bonnet up slightly further down. I’d passed many such scenes on my journey down through Sussex. But it’s all part of the landscape. Frustrating for those involved – especially when you’ve got so close – but strangely appropriate from a third-party perspective. 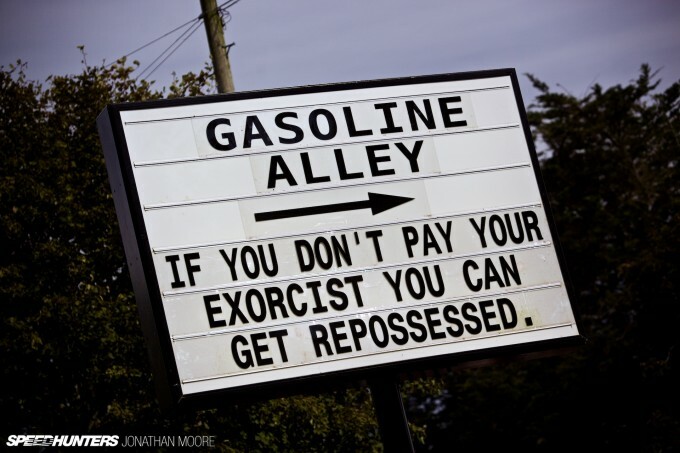 They’ll all get there: help is always in plentiful supply. Attendees come from all over Europe, mixing and matching nationalities. 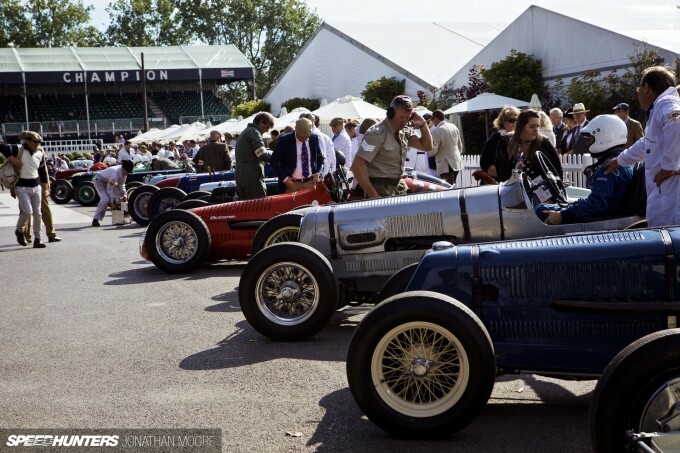 Brits in oh-so-Yank hot rods; French in Jags; Germans in Maseratis; Americans in Talbots. 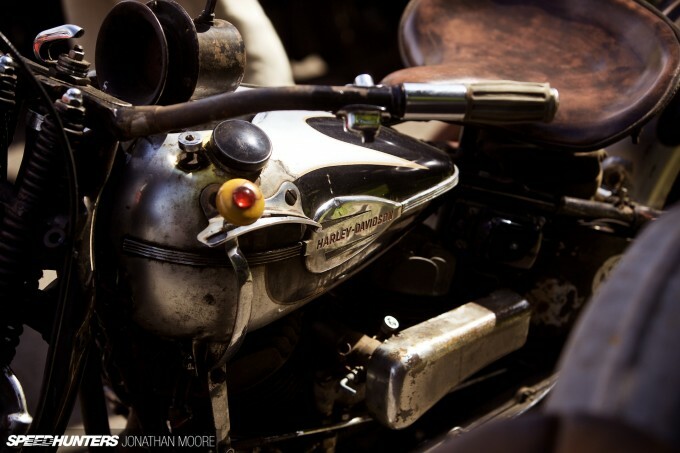 Many have made the long-distance pilgrimage in their own classics with all the inherent risks of unreliability. 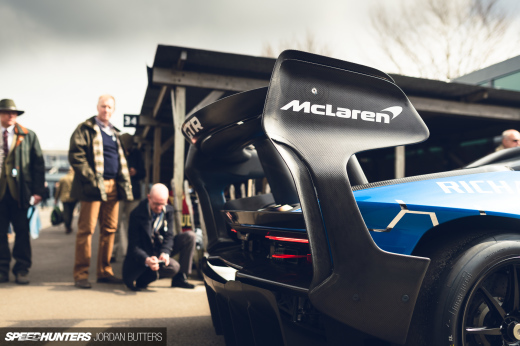 But the Revival has the same feeling that has made Le Mans the icon it is. Travelling there is as much part of the event as the weekend itself. Sometimes the journey might be a royal pain in the backside, but the manner of your arrival is important. It’s not just attendees’ cars that have issues of course… The positive side of this is being able to peek into a constant fan of open bonnets, whether at massive American V8s in Fairlanes and Galaxies or the tiny transverse four-strokes in Minis that are almost inexplicably pitched against these behemoths. 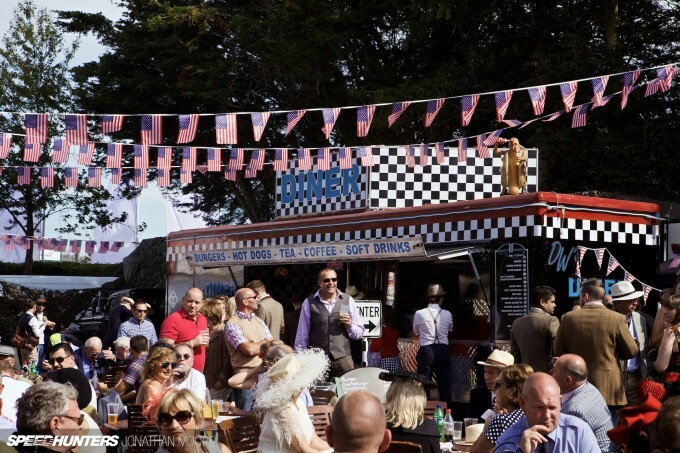 All the races at Goodwood relive matches from the track’s heyday. 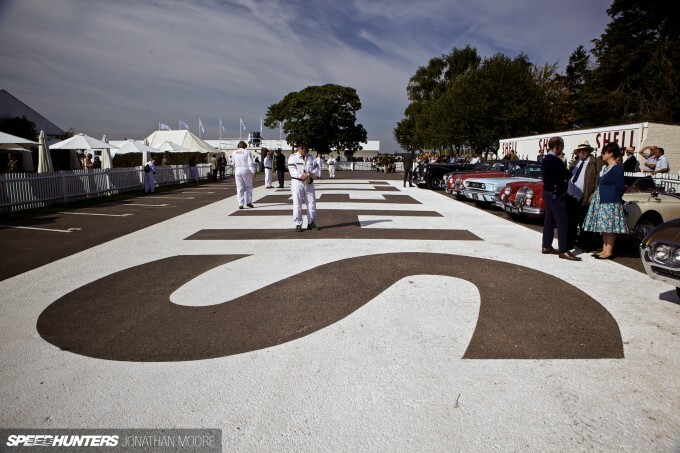 The St Mary’s Trophy for touring cars; the Fordwater Trophy’s early GTs; the Can-Ams and sports prototypes in the Whitsun Trophy; the iconic sportscar marques reliving the RAC TT races. 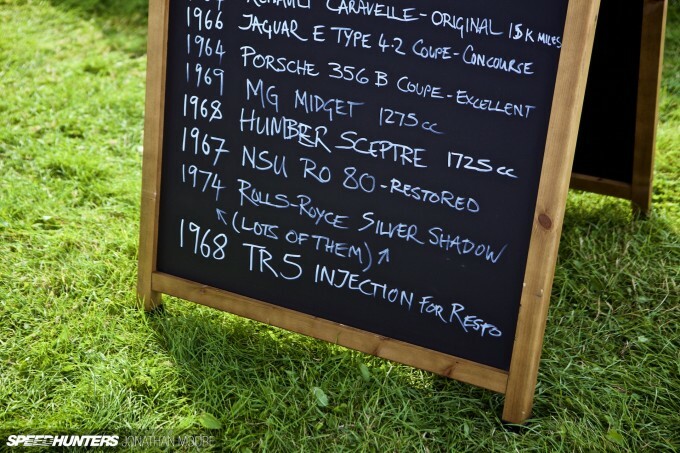 Alongside the RAC TT enduro, the Lavant Cup is always something special, typically bringing together a particular marque or series. 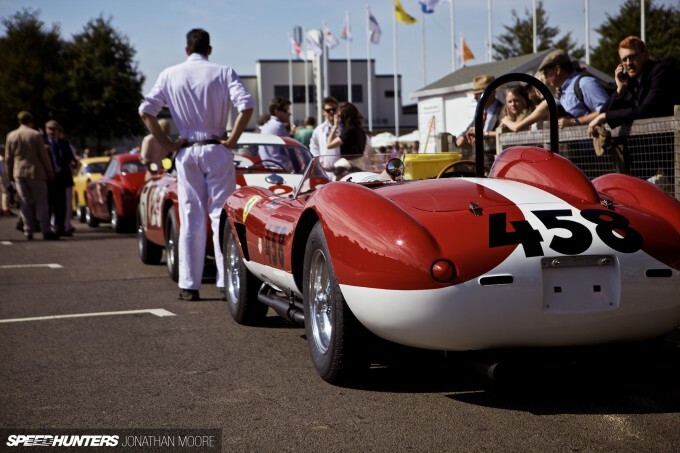 This year it was the turn of Ferrari to take centre stage, painting the main paddock in a sea of scarlet. 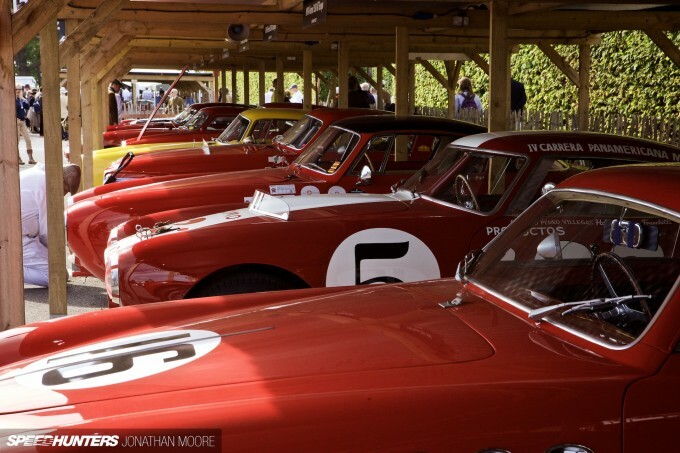 It was a truly inspiring sight: 27 of the finest Prancing Horses of the 1950s, mixed in with further 1960s GTs that would be racing in the RAC TT. 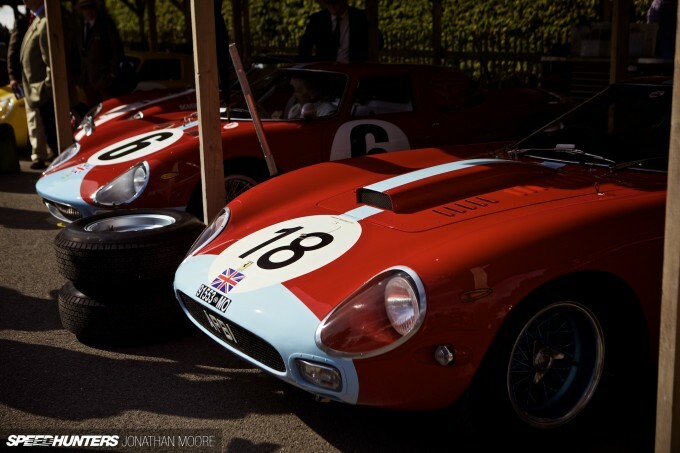 Seeing so many variants of the iconic 250 in one place was a privilege: from MM (Mille Miglia variants from the early ’50s), GT Boano and Europas through GTOs, LMs of the ‘60s – and even the famous one-off GT SWB Breadvan. 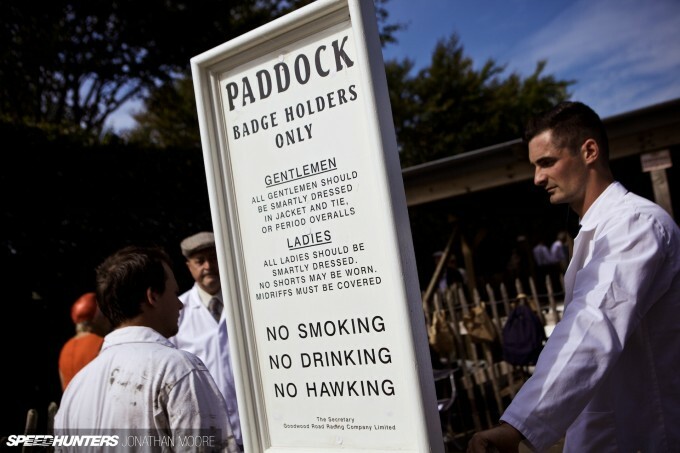 Across the way, almost hidden behind an old World War II hangar, was the Sussex Trophy paddock. 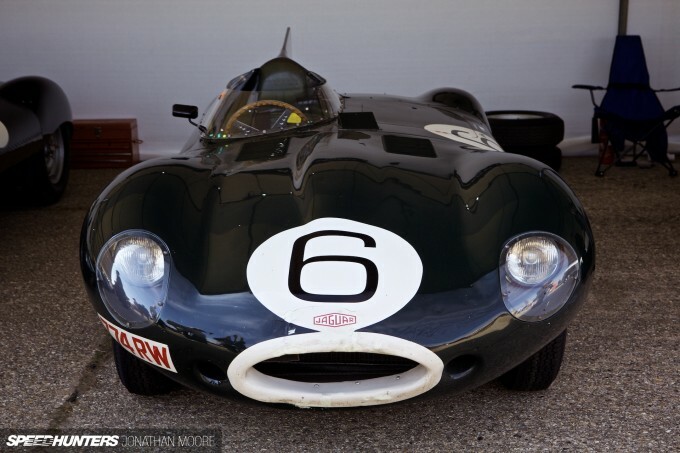 There another delight, with no less than eight Jaguar D-Types. Eight. That’s a tenth of the entire production run! 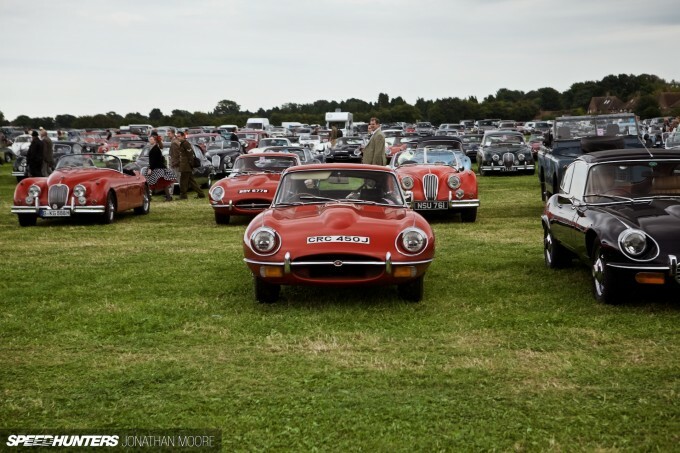 If you like E-Types, which any sensible person does, then it was overload in the RAC TT Celebration race, which brought together the aforementioned ’60s Ferraris with seven E-Types (FHCs and Lightweights included) and eight AC Cobras. 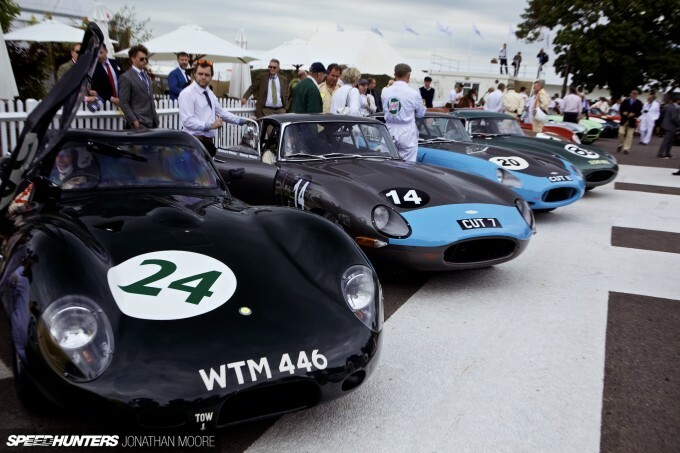 The latter provided a guard to another incredible gathering that only Goodwood manages to pull off: all six original Shelby Daytona Cobra Coupés were brought together – I’ll be talking about that in a separate story. More and more period support trucks are being restored as well. The beautiful Ecurie Ecosse transport and sleek Mercedes high-speed carrier are well known, but then this Jaguar transporter was very cool as well – so much more stylish and unique faceless modern artics. 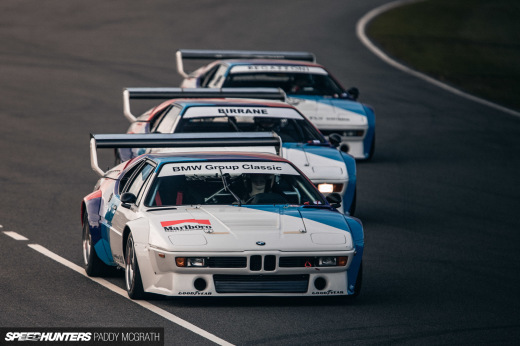 I’m more naturally drawn to the GTs and touring cars, but ignoring the earlier cars is always a mistake. 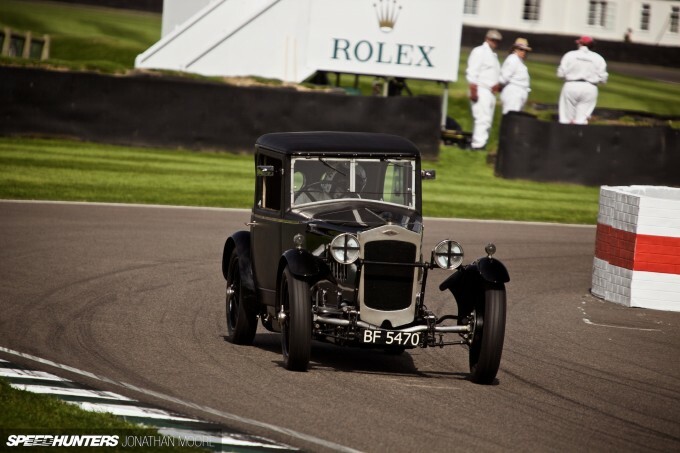 The Revival turns back the clock even further with the Brooklands and Goodwood Trophies for pre-War racers. 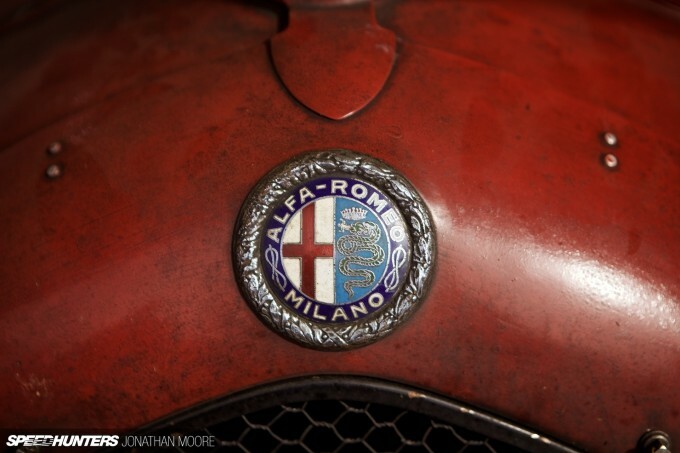 The latter swarmed with ERAs and Bugattis, which turn a surprisingly furious pace. 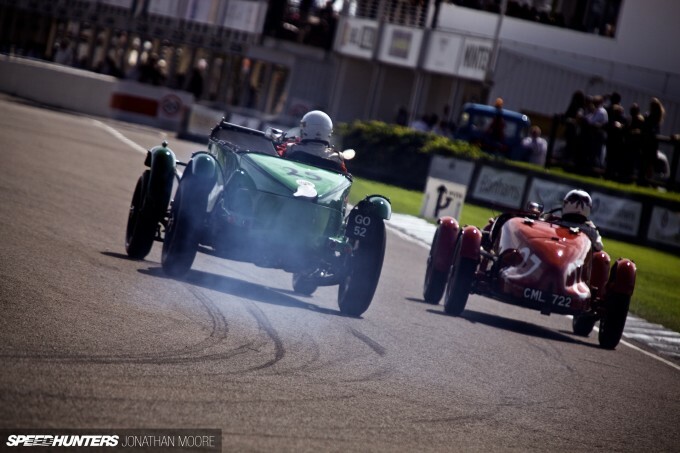 It was the same with the Brooklands cars, which echoed the competition seen on the massive oval during the ‘30s: tiny little missiles being bullied by hulking, drifting monsters – as seen here with a Talbot AV105 (one of three 1931 factory cars at Goodwood) literally smoking a diminutive Aston Martin Ulster. 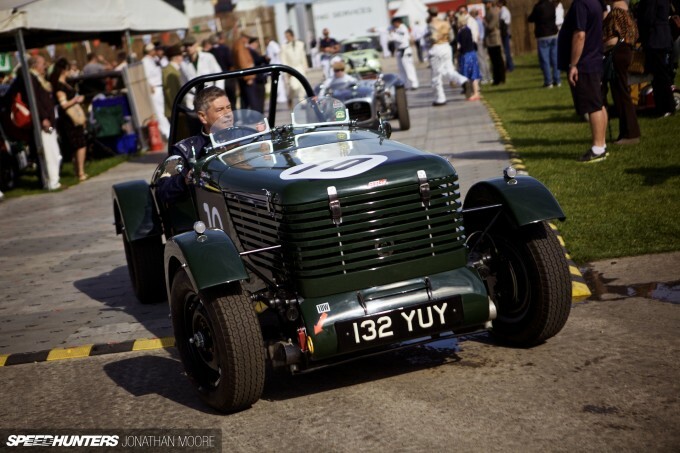 Taking top prize for entertainment, even above the slide-a-thons that were the big Bentleys and Talbots, was this incredible Aston-powered Frazer Nash Saloon – nicknamed ’The Owlett’, due to the round windows on its peaked rear – from 1928. 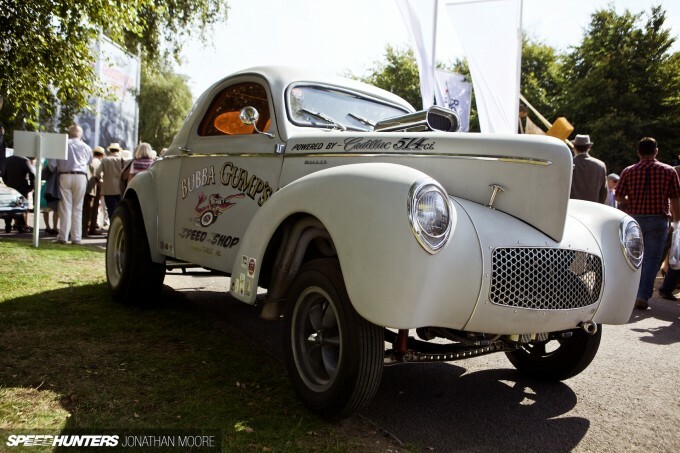 Straight out of Wacky Races, this upright machine of madness was careering through corners, driver all crossed up, soft suspension canting the car over to crazy angles. Fabulous. 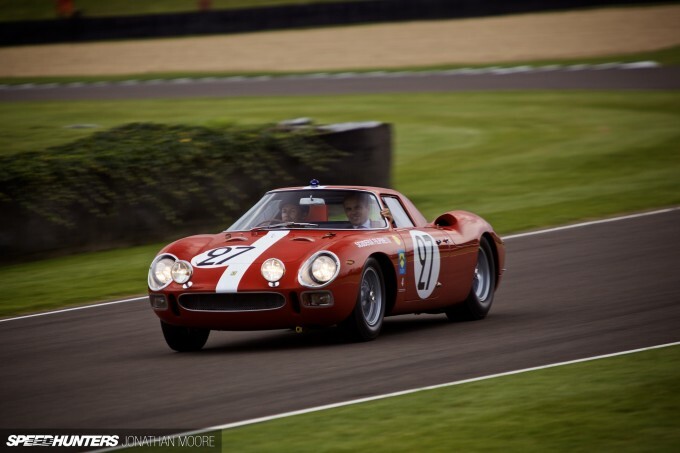 The Goodwood track was active between 1948 and 1966 before closing its doors, the owners unwilling to modify the track to accommodate increasingly fast cars. It’s why we’ve been gifted such a period gem of a track – though it’s also why modern races will never be sanctioned here. As with so many tracks in the UK, the circuit describes the perimeter of an old World War II airbase: this was formerly RAF Westhampnett. 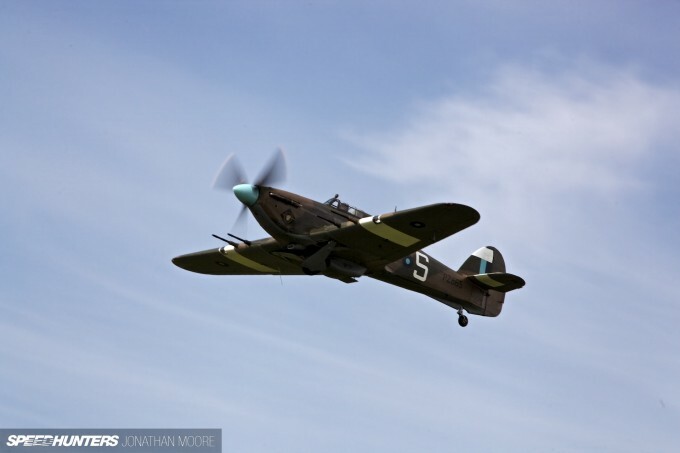 It was a back-up to the nearby primary fighter base of Tangmere, and played a key role in the Battle Of Britain, the epic air battle that took place 75 years ago. 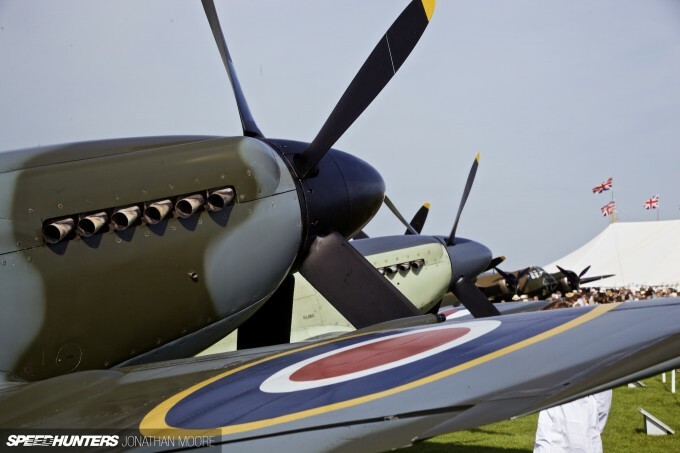 The Revival brought together a phenomenal ground display of Spitfires and Hurricanes. The line-up of the former was staggering: thought to be the largest number in one place since the 1950s, with 28 on show. Again, simply amazing. 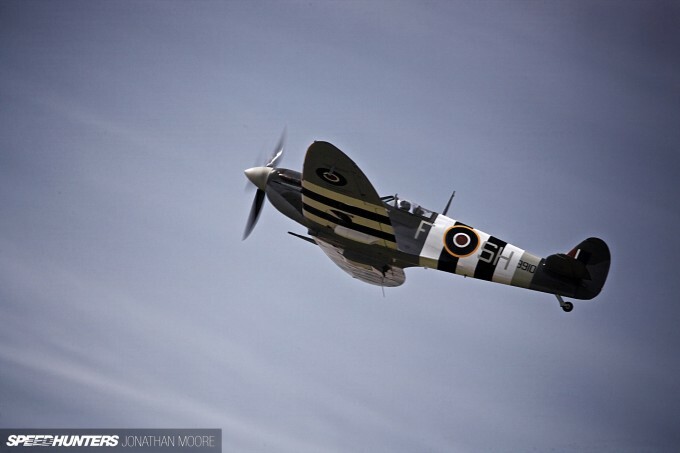 Many foreign-crewed squadrons flew out of Goodwood, including Polish, Belgian and, appropriately, New Zealand units. 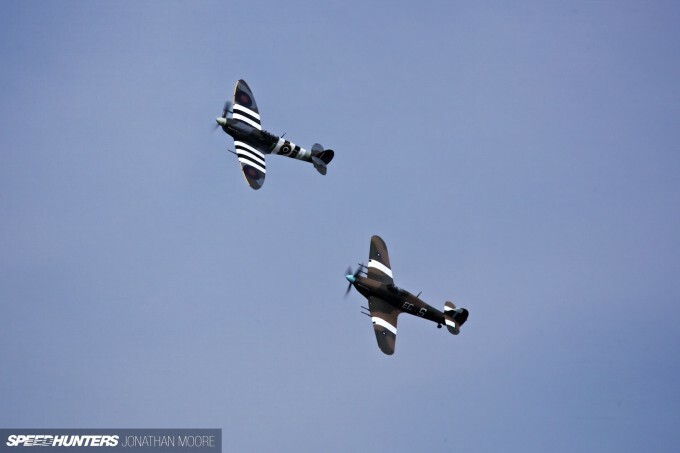 Several Spits and Hurricanes also flew aerobatic displays, filling the air with the unmistakable growl of Rolls-Royce Merlin V12s. The encouragement of the full-on period theme seemed a little strange when it was introduced at the first Revival back in ’98, but now it’s both all-encompassing and the main attraction. 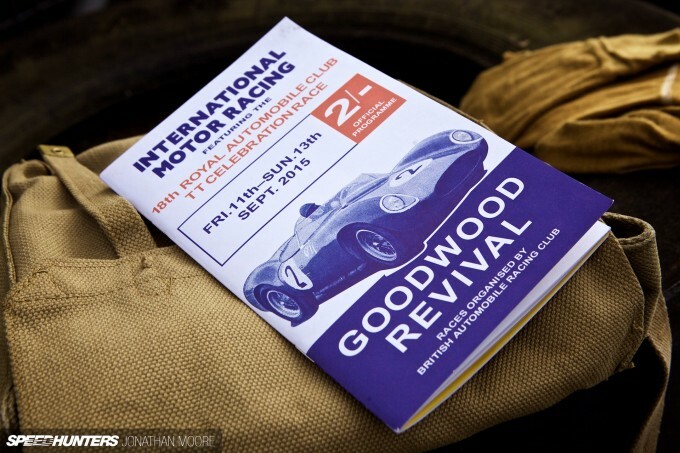 Even the race card and event programme are designed in full vintage style – and that extended even to the advertising. A large proportion of the ads in the main programme featured ’60s designs; it was disappointing when you came across a company who had posted a modern theme! 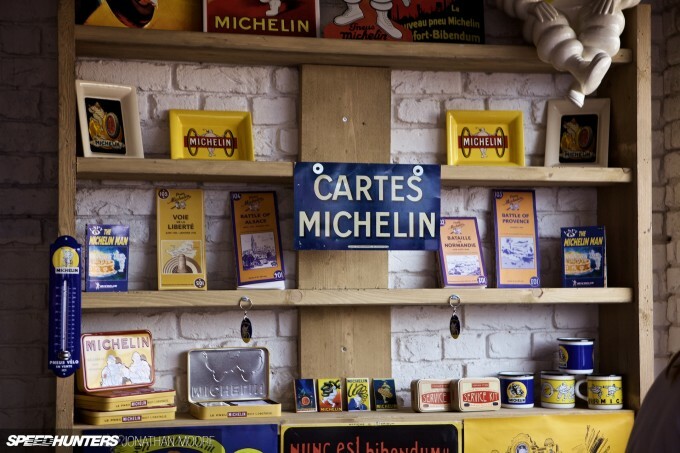 Heritage is increasingly recognised as being a valuable commodity, and the small cluster of retro shops has now grown to a small town’s worth. 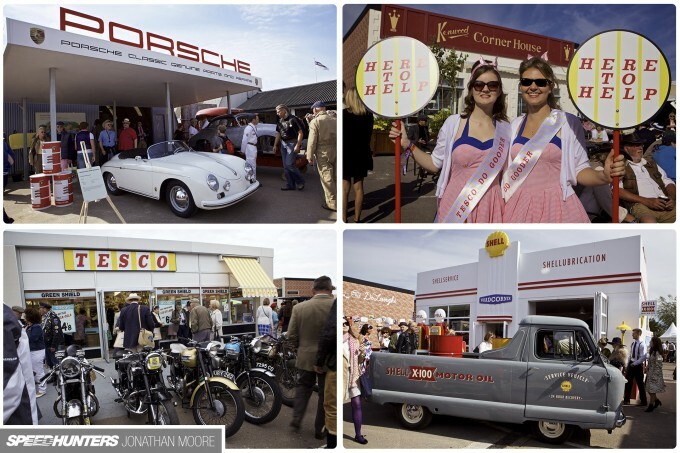 Old school supermarkets and coffee shops were joined this year by a whole row of new old premises – Porsche, Michelin, Shell and more, all trading on their long histories. 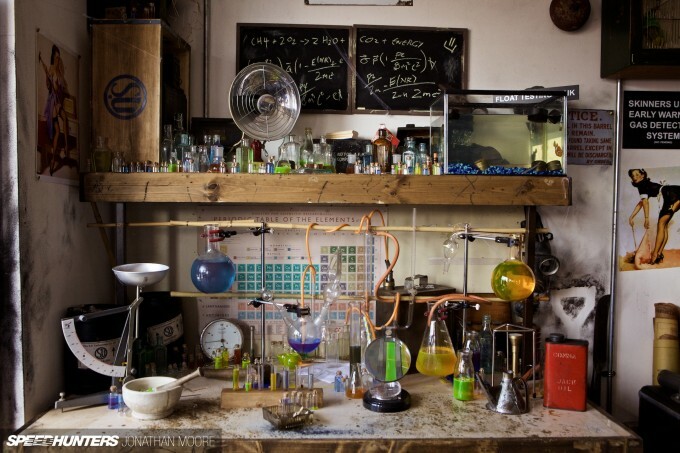 SU Carburettors had recreated a complete R&D facility in its unit, which featured this lethal-looking chemistry bench and the awesome-sounding Willoughby Atomiser. 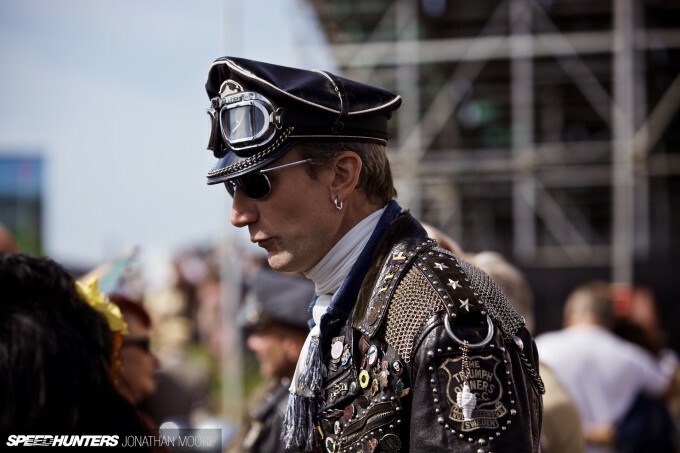 It all shows the lengths that people go to at the Revival to stand out from the crowd. 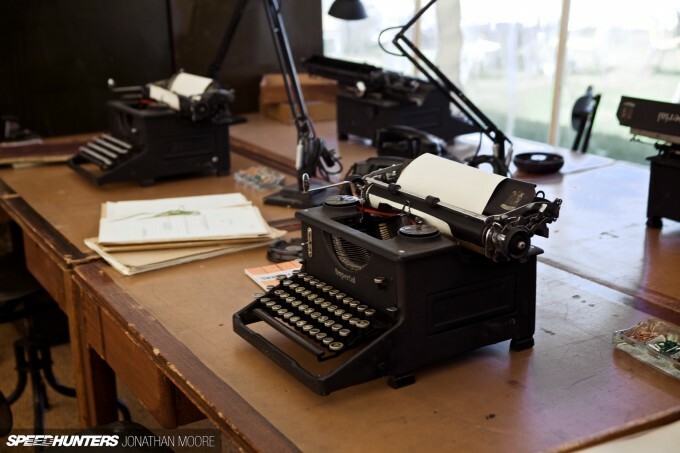 Even the press tent joins in to the full, the entrance decked out with the latest kit for writers and photographers! 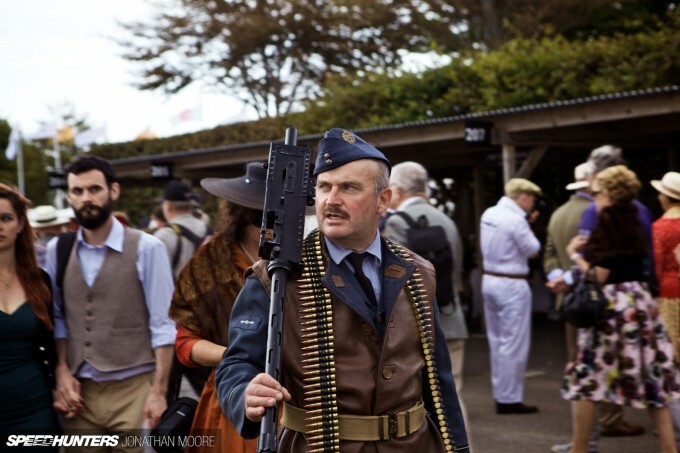 You’re really not allowed trackside unless you’re wearing vintage gear – cameras aside. 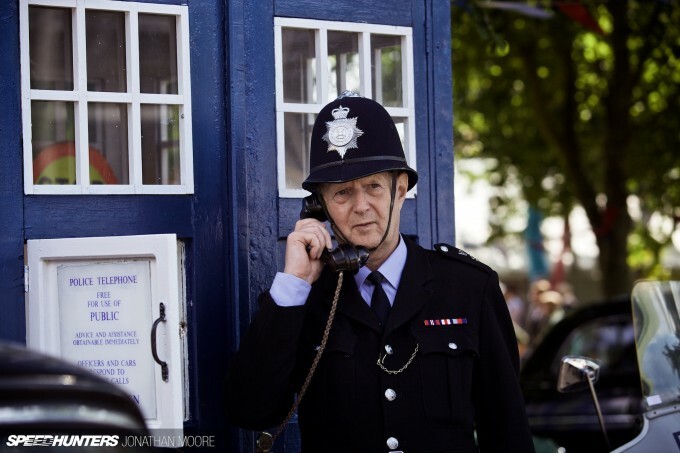 The police presence does get heavier each year at the Revival: alongside an iconic Police Box was a phalanx of period cop cars, from high speed pursuit Sunbeams to more sedate Ford cruisers. Perhaps it’s no wonder that some people remain heavily armed, no matter how long ago the war ended. 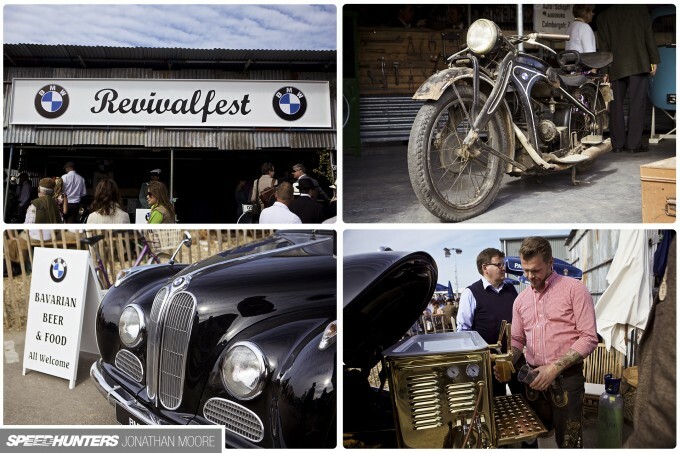 Germanic-themed refreshment could be found as usual in the bike paddock, with BMW’s Revivalfest bar operating out of the back of an old BMW saloon. 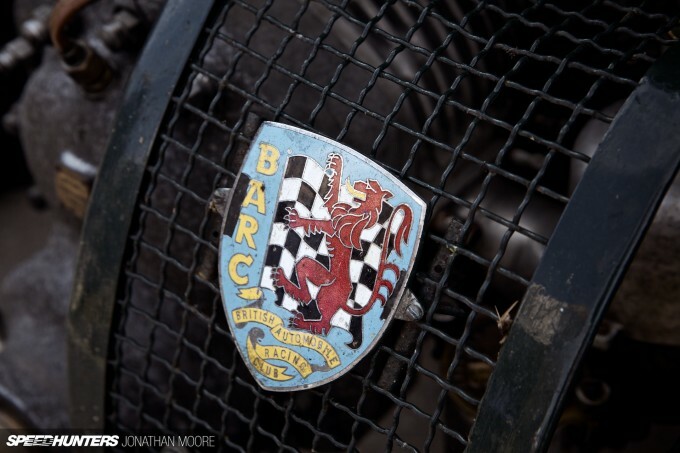 There were some epic bikes around: many low-slung café racers, a host of bluff Nortons, Matchless and other vintage racing bikes in the Barry Sheene Memorial Trophy paddock. But I loved this 1930 Peugeot board-track competition bike that I came across in the main paddock. It’s a P50T AeroPeu, mounted with a 100cc, nine-cylinder radial engine taken from a scale model aircraft! 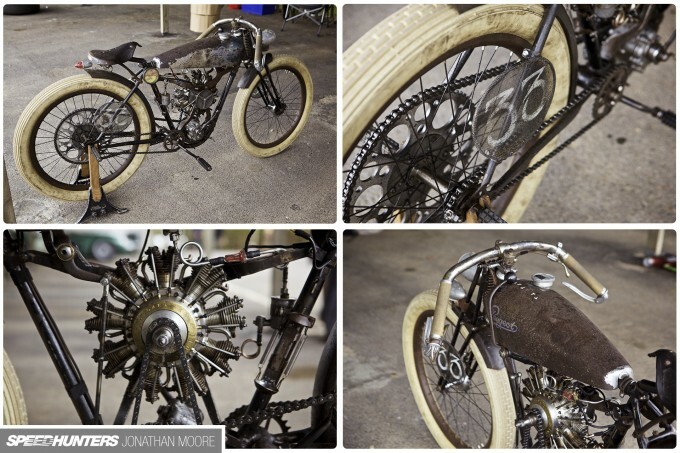 The modern build looks completely right and authentic: that radial engine is superb. 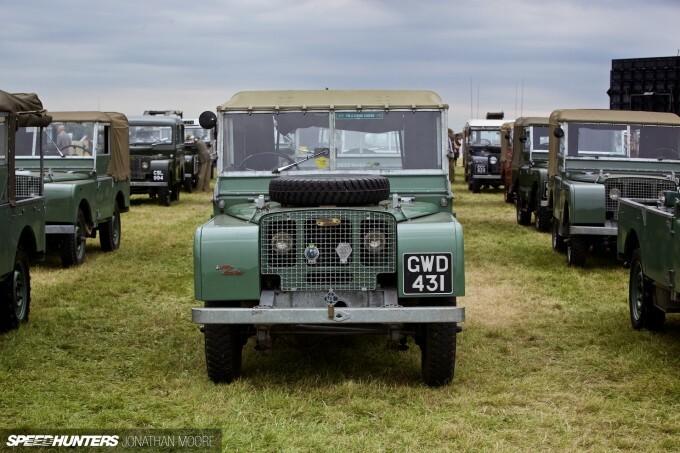 The infield featured a big display of classic Land Rovers made from – of course – ’48 to ’66, celebrating the end of modern Defender production. 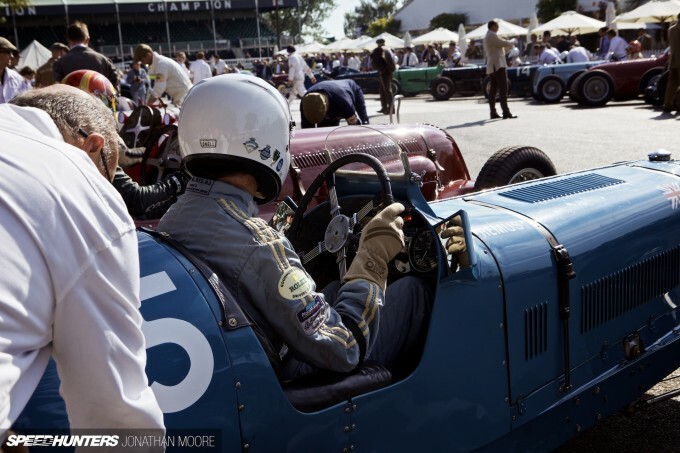 Headlined by a swarm of regular Series 1, there were also fire trucks, armoured cars, massive-tyred forestry vehicles and even the support vehicle for Donald Campbell’s Bluebird CN7 Land Speed Record racer. 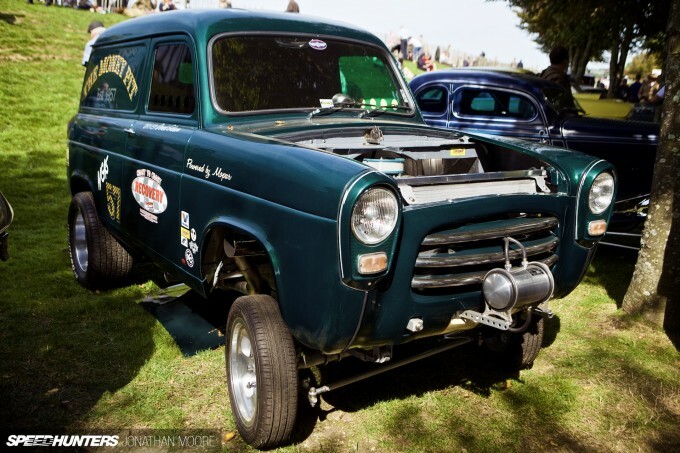 Back in the heart of the Revival was an area dedicated to hot rods and gassers, a tribute to the street revolution that happened in the States in the ’40s and ’50s and led to the explosion of drag racing. 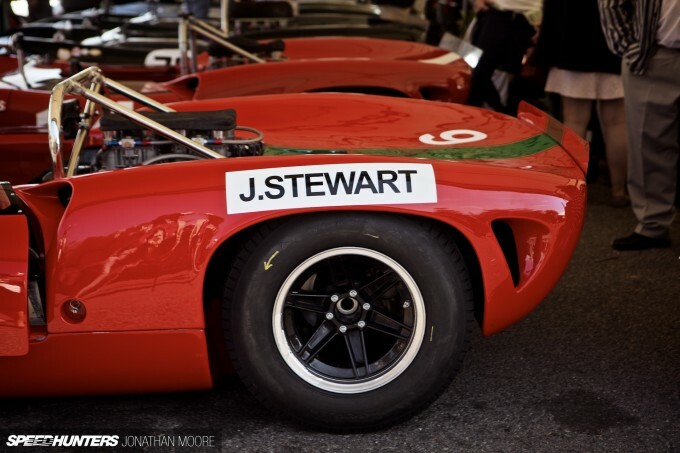 Around 30 vehicles provided a counterpoint to the more restrained machinery around them, with their massive motors unleashed on track every morning. 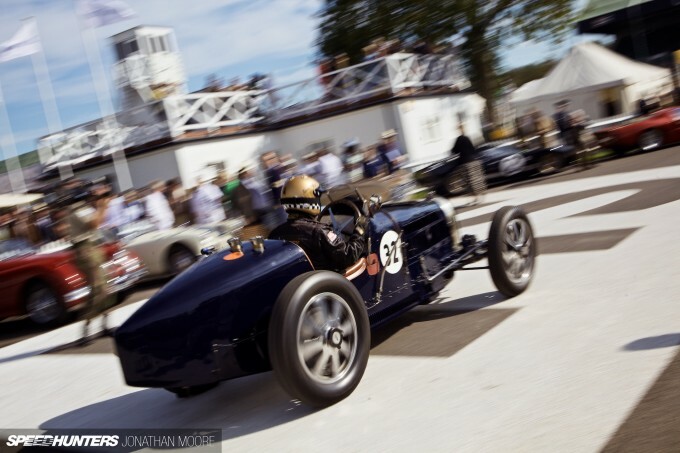 The Goodwood Revival is as captivating as ever, each year piling on yet more amazing machinery and sights to take in, an all-encompassing time capsule of joy. Whether to watch, work at, take part in – or even buy at, as it seems there were ‘lots’ of Silver Shadows for sale – it’s simply the most amazing place to visit. 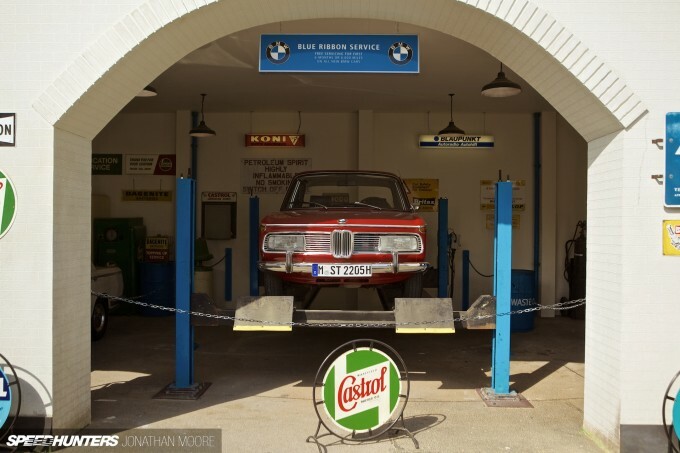 Put your flat cap on, load up on oil and head down to automotive heaven. 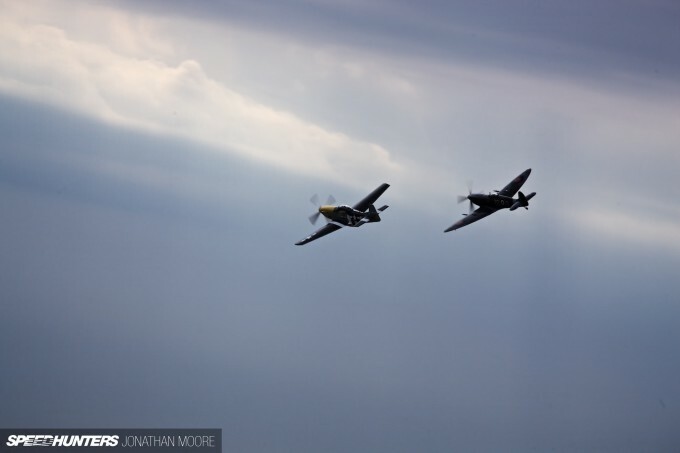 @Jonathan Moore Really evocative selection of images. 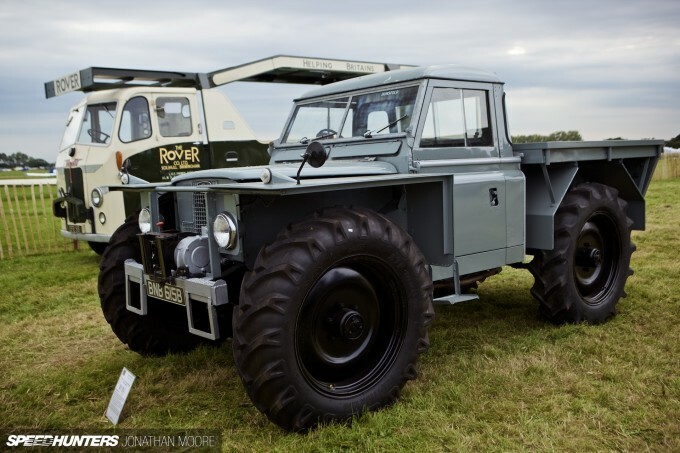 Any info on that monster-rimmed Series 2 Land Rover? Great, wonderful pictures, they really capture the festivals spirit. Serious question: just how ready should one's body, mind, and spirit be when you go to events like this? And is it enough readiness? I purposely tried to avoid this post in order to avoid become overwhelmed with jealousy. I failed. Also, how tall was that very tall man? You had me at oil..
Paddy McGrath Aw, bless ya Paddy. You were missed. But hell yes – that guy! Stilts maybe?! UWerqxTeam_MJ Quite ready! It's all about mind management. Slip into a bit of tweed and you're halfway there. Jonathan Moore UWerqxTeam_MJ But I can't afford tweed. I really appreciate the manner with which this was shot. It adds a little more nostalgic feel to the article. Well done, sir, well done. Just make some wool clothes and pee on them to 'fix' the resulting cloth.... It's what tweed have been doing for years. 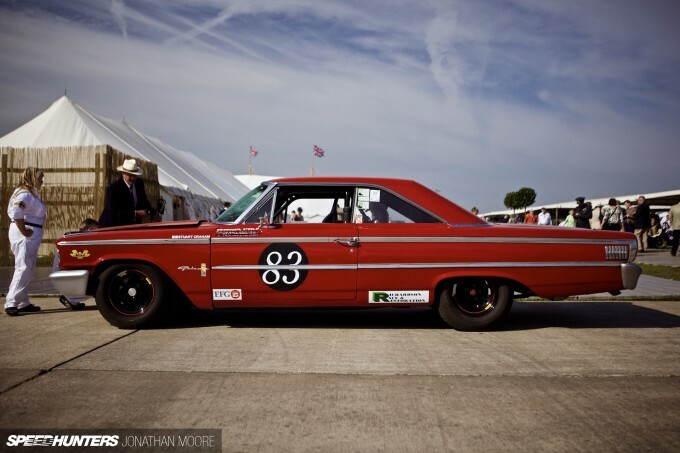 Jonathan Moore any more photos of that Galaxie? The Bassett wheels and interior look a bit modern, but I'm truly digging it (I'm a fan from across the pond, if you can't tell by the car I'm focusing on). 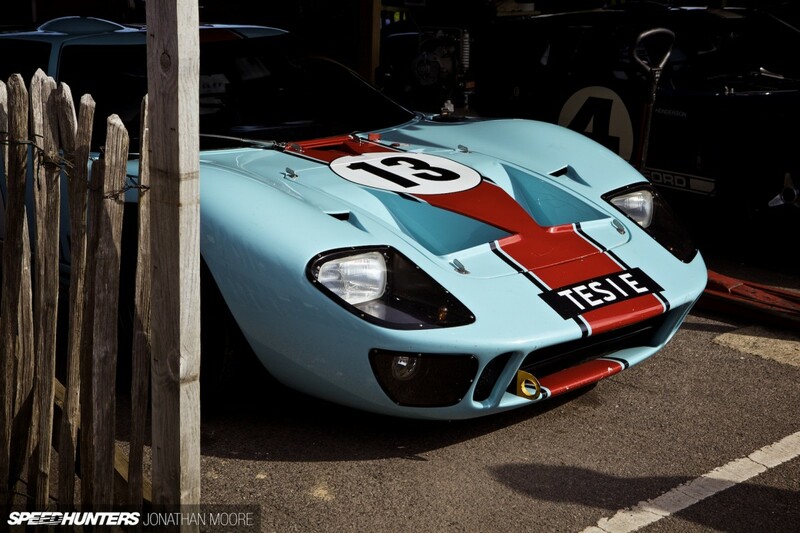 It's such a shame thqat the only thing America has that gets close to this is the Monterey Historics. Thank you guys for covering this and the FoS every year, I love it! 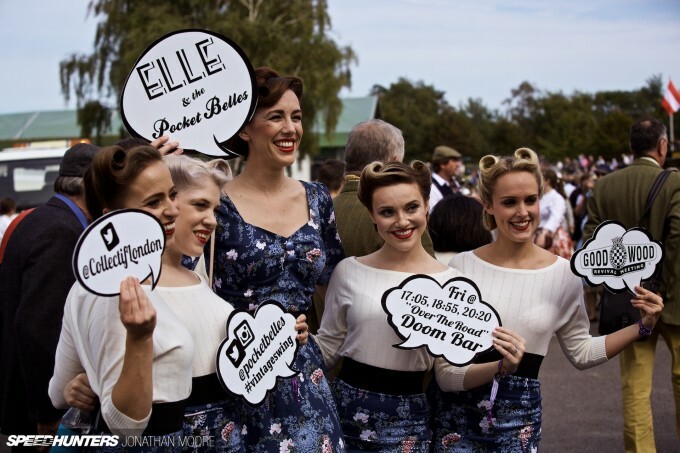 Adding the period ambiance, the required clothing, the aircraft, the music, all of this is what makes this event so special. Great photos, John. I love your use of light and shadows. Dramatic yet, elegant. 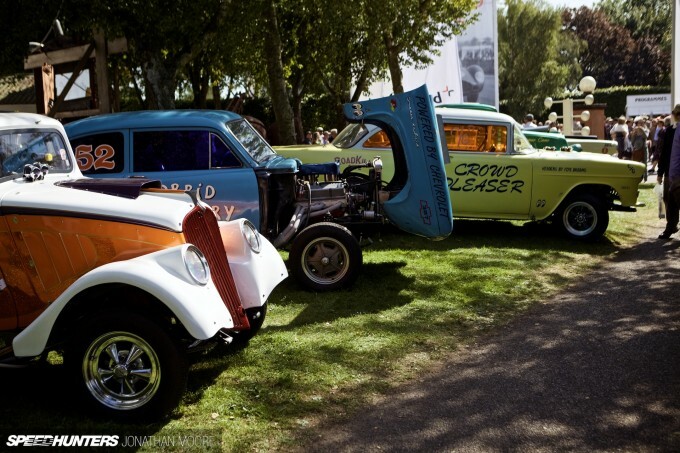 John Key NZ Wouldn't that be just a kit-car show? Well done. Nice tough with the collages. D1RGE Ah yes, well that is an event I'd love to go to. In the meantime, you're stuck with me and Goodwood. Putslicksonit Hehe, aren't we just... More you say though? Well, there will be some spotlights to follow! D1RGE nah I mean how it's kinda quirky how people dress up in olden day clothing. 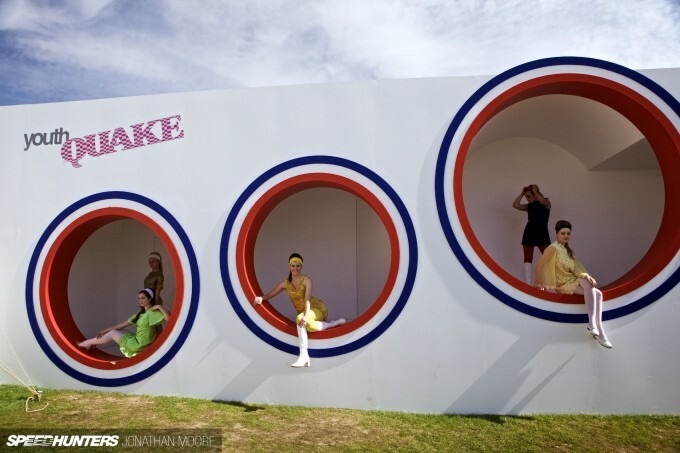 It reminds me of the Melbourne Cup (a horse racing event in Australia). To call it vehicular cosplay would downplay the importance of the rides present. D1RGE Well, if you care anything about motorcycles at all, the Vintage Festival at the Barber Motorsports Park in Alabama has become quite an event. 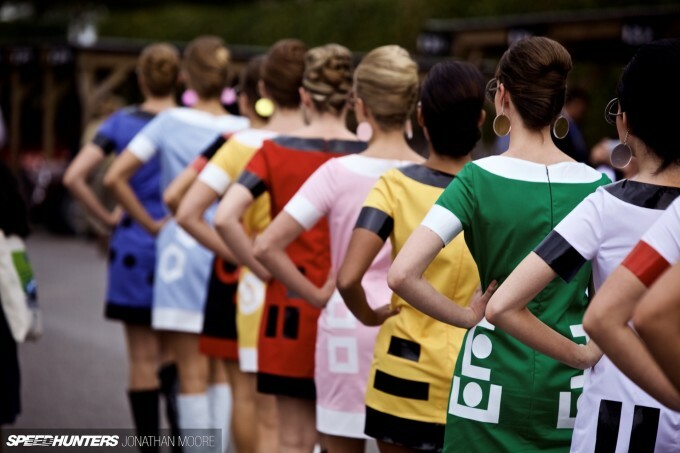 Similar idea without the period dress. Thank you Jonathan; I now have wallpaper for the next month or two!! Great coverage! One of these years I'll make it across the pond to witness the Revival firsthand. Fantastic pictures. I can't make up my mind which I like the most, though that tiny radial-engined Peugeot board racer is just beautiful. Then there's the shot of the four down-draught Webers... Great stuff. I will get there one day.